Dr. Kirk Dombrowski’s new proposal was selected by the Rural Futures Initiative to receive funding in 2016. The proposal is titled Identifying the Interrelationships Between Social Determinants, Self-identity, and Public Health in Minority Rural Communities: Photovoice + Random Spatial Sampling Survey. Dr. Kirk Dombrowski (PI), of REACH Lab and UNL Sociology, is partnering with DHHS and Two Rivers Public Health Department to combine community based participatory research (CBPR) with traditional random spatial sampling survey to better understand minority health disparities in rural communities. 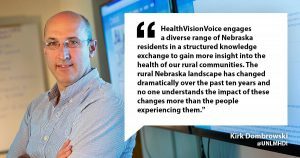 The research results will translate into interventions, tools and data that communities can use to understand and address minority health disparities in rural Nebraska. How Can We Help LGBT Homeless Youth?